If 22-C looks like someone you’d swipe right on, you can simply pass your napkin across the aisle. The in-flight assists have space for a name and phone number as well as a word of encouragement. “be a little old school. write down your number and give it your plane crush. you never know…,” the text reads. The napkins have been accompanying flyers’ precious pack of pretzels for the month of January but gained national attention when travelers began posting photos two weeks ago. After tweets calling the branding “creepy AF” took off, plenty of other people sounded off on the carbonated crush. Other people found the initiative cute, funny, and on-trend with Valentine’s Day right around the corner. One Twitter user even shared her own story of meeting someone on a plane while praising the two companies. This isn’t creepy–it’s cute! I get numbers and notes on napkins and I’ve even given mine out a time or two…it’s a cute marketing idea especially before Valentine’s Day. 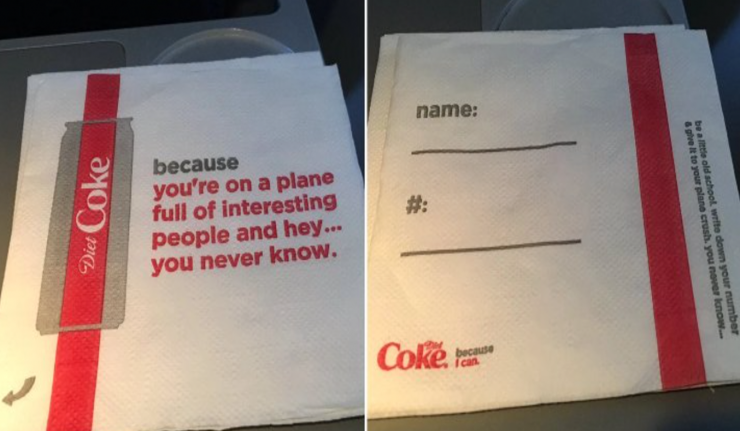 For Coca-Cola’s part, they issued an apology and assured customers that the napkins would no longer be passed out on flights. Delta echoed similar thoughts – acknowledging that napkin matchmaking wasn’t their best move. Airlines are no stranger to controversy, but Delta may be thankful that the crisis communication cavalry wasn’t called in the way United did back in 2017 when a passenger was forcibly dragged off the plane.